12 volt, 4 batteries charged by: engine, wind generator, solar panels, shore power 2 X Engine & 2 x House batteries. 420 W Solar Panels with rain collecting channels. MPPT solar regulator. 1500 W Inverter. Many engine spares. 6 x Diesel Jerry Cans of 25 Ltr each. 2 x Butane gas bottles a 10 kg. 1 x R34A refrigerant gas bottle 3Kg & pressure gauges. Open CPN Navigation software and tide program. Two Autopilots + wind vane & 3 depth sounders. Freiberger Sextant. Nautical charts worldwide. Bilge pumps are on float switches. Still in her original ownership this is an exceptionally well set up and equipped yacht for her size. Her owner set of in 1993 to circumnavigate, visiting Panama, Galapagos, Marquesas, French Polynesia, Fiji, New Zealand, Fiji, Wallis Island, Fiji, Australia, Fiji, Solomons, Papua New Guinea, Bali, Cocos Keeling, Seychelles, Madagascar, South Africa and Thailand amongst others, and has lived aboard for the last 25 years. Health issues reluctantly force a sale. 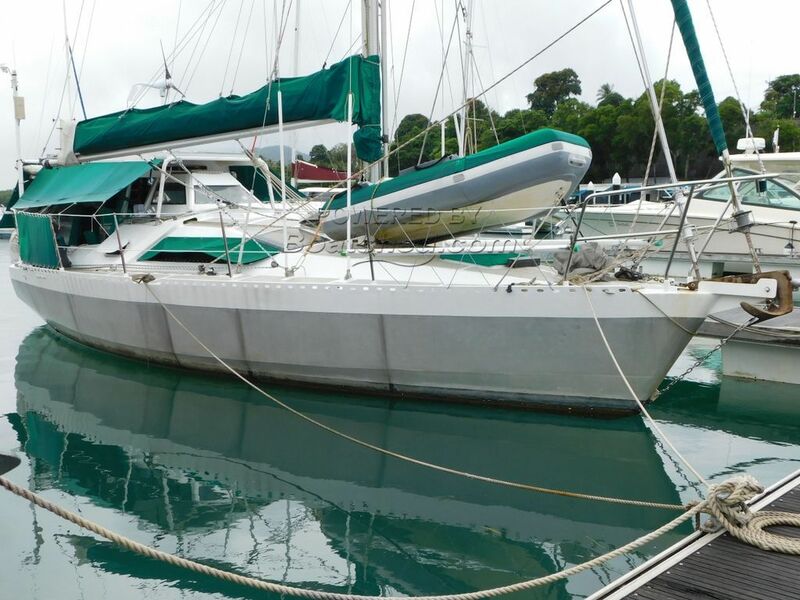 This Ovni 30 Sloop has been personally photographed and viewed by Alan of Boatshed Phuket. Click here for contact details.